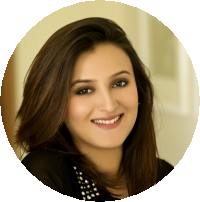 Redah Misbah is the heiress to the Depilex Brand and is the daughter of Masarrat Misbah, who is the owner and founder of Depilex Beauty Clinic and Institute. Depilex Beauty Clinic and Institute is the oldest and largest brand in the field of beauty therapy, cosmetology and hair sciences in Pakistan. Hello, how are you guys doing? It’s a fine day and you are on your way to make things happen. You are full of positive vibes and all set to take on the world. Out of nowhere, you come across a girl (or woman) who makes you wanna push her to the loo and end the havoc she has spread with her makeup. She is the ultimate cosmetic clown and all you wanna do is to fix those face faux pas. Yes, I am talking about some serious beauty blunders that girls make without even realizing their aftermaths on themselves (and others). Makeup is a personal choice and one is free to wear it the way they want it – No, I don’t buy that! Given how much I love makeup, I just can’t see girls destroying their appearance and look instead of making it better. By this post, I intend to be completely compassionate and my sole motive is to make you aware of the biggest makeup pet peeves that others have but aren’t telling you (let’s boycott such people, shall we?). Without further ado, let’s have a look at those mistakes and save ourselves from social embarrassment. This. Good heavens that is annoying. Ever come across someone whose face is different than their neck? It is disturbing and makes you feel as if you are looking at two different persons at the same time. One might be in hell of a hurry but they just can’t leave their home without making sure that the foundation is perfectly settled and doesn’t make your neck feels ignored. Once you get to your favorite store, invest in a foundation that rightly matches your skin tone. Tip: test the foundation by applying it on your face or neck and not on the wrong areas like hands or arms. This will help you pick just the right tone. Also, take your time while blending in the foundation and NEVER forget to dab some on your ears and neck. Second on my list, this makeup mistake is equally bad. If you’d have done it in the 80s or early 90s, I would have been the first one to compliment you. Unfortunately, that era is long gone and it’s 2016. Please do yourself and others a favor and never fall for this no matter how rad you think it will look. If you’re going for a costume party, sure, otherwise don’t experiment with this type of lips. If you are really fascinated with the idea of lined lips then only opt to fill your puckers with the clear gloss and not the lighter shade of a lipstick. Thick eyebrows are surely in vogue these days and every girl feels tempted to rock the trend. I have two reservations as far as having a thick brow is concerned. A, it should go with your face and features. B, you shouldn’t draw (literally) those lines and fill them with eyebrow pencil to make them look thick. If you’re into theater then it’s alright to go all free with such makeup choices and if you’re not, then please don’t fake it. A quick fix? If you have thinner eyebrows then just make small feathery strokes with a pencil and apply brow powder with an angled brush along with the natural line of your brow. Don’t sweat it too much. Go light and you’ll get natural-looking thicker eyebrows. Clustered eyelashes can put you off instantly. No matter how perfect the wing of your liner is or how strongly you have aced your eye makeup; if your lashes are messy, you’ve lost it. Where mascara can enhance your eye, too much of it can do the opposite. Whenever you’re applying it, make sure you clean the wand at the tip of the container to get rid of the excessive residue. Wiggle the brush from base of the lash to the tips as well as from side to side. In case the mascara gets thicker because it’s drying up (or due to any other reason), add 2-3 drops of saline solution, stir the tube and voila! Remember, excess of everything is bad so be vigilant with your mascara. Who doesn’t like a pop of color? It’s a great idea for your wardrobe or nail color but for your eye shadow? Umm, I don’t think so, unless you’re on a fashion runway or are imposing lady gaga during the sleepover at your bestie’s. Girls who go for bright eye shadow and equally bright lipstick provide ample entertainment for others. Make sure you’re not one of them. Never, I repeat, never choose bright shades for eyes and lips at the same time. If you’ve opted for bold lips, go subtle with your eyeshade. Start from pastels and see how they go. Some girls do that, I am not even kidding! A pink glow on the cheeks is definitely flattering but that doesn’t mean one should paint their cheeks with every inch of blush-on left. It makes your cheeks look sunburned or freshly slapped. Don’t let that happen to yourself, please. Also, if you are going for a shimmery blush then always apply it with care. Prefer wearing it in night, too much shimmer in daytime gives an impression that you’ve gone a little too far with your makeup. Makeup is overwhelming and those who love it will truly understand why I am saying this. One might think that more makeup equals being prettier but it is definitely not the case. No one likes a “made-up” or cakey face that has layers of cosmetics on. Stick to your essentials and never go overboard. Avoid heavy foundation and tons of powder that can make you look chalky. On a normal day, a little base, blush, gloss and mascara gets the job done so you don’t need to go an extra mile to look at your best. That’s pretty much it, ladies. Hope you’re not making any of the aforesaid makeup choices and if you are, well you should stop. Let me know what your biggest makeup pet peeve is and which face faux pa just puts you off instantly (you know where to hit me up). A big shout out to all of you who read my posts and stay in touch! Until next time, stay beautiful!